The United States Mint started selling the 2011 Gettysburg National Military Park Quarters directly to the public today in bags or rolls of the new strikes. These coins honor the military park in Pennsylvania with a design on their reverse. Each Gettysburg Quarter marks the first of five planned 2011 releases of the Mint's America the Beautiful Quarters® Program. The program itself debuted last year and honors sites of national interest from around the United States and its territories. Gettysburg National Military Park was established in the 1800's in Pennsylvania to preserve the location of the Battle of Gettysburg fought during the American Civil War and honor those who were participants in the conflict. The Battle itself is considered the bloodiest of the war and resulted in thousands of casualties. This site also hosted President Abraham Lincoln when he gave his now famous Gettysburg Address a few months after the battle during a dedication ceremony for the cemetery located there. The Gettysburg Coins themselves were actually released into circulation on Monday, January 24, 2011. On the following day, January 25th, the United States Mint in association with the National Park Service held a release ceremony for the strikes at the park's Museum and Visitor Center. 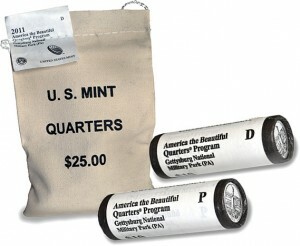 Those wanting to obtain the new coins can do so via these bags and rolls directly from the Mint. The bags contain 100 circulation quality strikes from the buyer's choice of the US Mint's facility in Denver or the US Mint's facility in Philadelphia. The Mint is charging $49.95 for the bag which has a face value of $25. The rolls option entitles buyers to one roll of 40 circulation quality strikes from the Denver Mint and one roll of 40 circulation quality strikes from the Philadelphia Mint. These two-roll sets are offered for $39.95 and have a face value of $20. Orders for either product may be made by calling the Mint at 1-800-USA-MINT (872-6468) or via the Mint's website of www.usmint.gov.